It was a case of meet — sorta — and definitely no greet on Inauguration Day at the Vista office of Rep. Darrell Issa (R-49th District), according to representatives of 26 constituents in a group calling itself Courageous Resistance Encinitas who tried to deliver a letter protesting Donald Trump’s installation to staff there. Closed door meet 4-page letter. Newfound public political action met a locked door and refusal to meet from Rep. Darrell Issa’s Vista staff on Friday. Jan. 20, according to constituents. Issa’s press spokesman said the office was closed due to “a federal holiday” and one of the woman in the group “later returned during business hours that day,” met with the office’s political director and had a productive 20-minute meeting. For the record, according to the Federal Office of Personnel Management that establishes public holidays for federal employees under Federal law (5 U.S.C. 6103) Friday, Jan. 20, 2017 was NOT a federal holiday although federal employees in the Washington D.C. area may take off the day. Postal delivery was made Friday and banks were open. However, it was Inauguration Day, a day now-President Trump subsequently proclaimed “National Day of Patriotic Devotion,” although all federal employees not in the D.C. area were required to work normal hours. Calvin Moore, Issa’s press spokesman, pushed back Thursday on the characterization of the federal holiday through a series of emails, saying, basically, that Issa gave his staffers the day off to observe Inauguration Day. Coincidentally, or not, after word went public Wednesday of the closed door incident, Issa’s web site featured an invitation to a newly called telephone town hall meeting scheduled for 2 p.m. Monday, Jan. 30. Issa said: “On Monday, January 30th, at 2:00 PM PT, I will be holding a telephone town hall meeting to hear from constituents about your concerns and priorities for the new year. I’d love for you to participate! For more information and to sign up, visit here. However, posting on social media, some constituents questioned the efficacy of a telephone town hall meeting. “From previous experience” Vista resident Joe Dusel said, “it seems that they select the questioners ahead of time, and screen for those that are on their side. This is what happened, according to Karen Abrams, who was with the group of about two dozen people at the office Jan. 20. 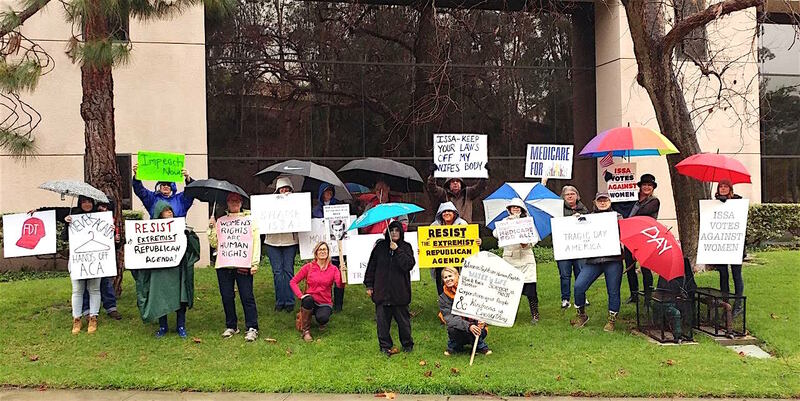 “Friday morning, while President Trump was being inaugurated in Washington D.C., 26 North County residents braved the elements to protest the new administration outside Congressman Darrell Issa’s office in Vista. After standing in the rain for about an hour-and-a-half, a handful of those present went inside to deliver a signed letter to their congressman, but Issa’s staff refused to acknowledge them. The constituents, who were assembled in the hallway, could hear the voices of the staff members inside the office, but in spite of their continued ringing of the doorbell and repeated knocks, Issa’s staff refused to answer the door. After about 30 minutes, I volunteered to stay behind to deliver the letter while the others in my group left. I waited in the hallway for another hour, during which time I continued to ring the doorbell and knock on the door. The voices of staff members were clearly audible and I suspect they were monitoring my actions via the closed-circuit cameras that line the hallway and stairwell of the building. I decided to conduct a test: If I left the building would they open the door? So, I placed the letter which contained all 26 signatures on the floor outside the Congressman’s door, and went to my car to retrieve my phone charger. When I returned five minutes later, the letter was gone. So, I rang the doorbell again, and this time, a man opened the door. “The letter I left here five minutes ago,” I said. “Who’s ‘we?’ the man asked. “I don’t know what you’re talking about. We’ve been here all morning.” he said gesturing to the woman, whose desk was right by the door. This exchange went on for several more minutes, but suffice it to say they were trying to gaslight me. It was insulting and infuriating. “As I’m sure you are aware, January 20th was a federal holiday and our offices were closed when the group arrived. One of the women in the group later returned during business hours that day and was able to talk with our district director for about 20 minutes or so about her concerns on several issues and deliver a copy of their letter to us in person. “I’m told they had a very productive and pleasant conversation. We, of course, are always happy to accommodate constituents who want to meet with us to discuss any issue. We encourage groups and others interested in meeting with us to reach out in advance so we can schedule a meeting at any time that is convenient to them. 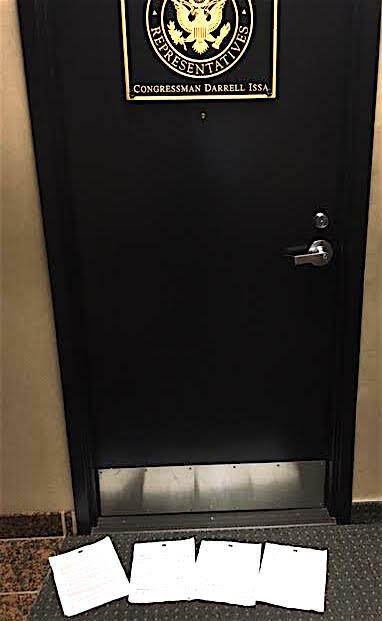 1 Comment on "Closed door policy at Issa’s Vista office?" Karen, that sounds so infuriating and beyond frustrating. The way those two staffers treated you was deplorable and inexcusable. His feeble show of power was disgraceful and indicative of the many problems within the current political climate. Representative Issa should not allow them to represent him in his office because their actions do not represent the good people in district 49. They have to be accountable for their actions.